Brett & Jacci have been coaching and mentoring other local real estate investors since 2009. If you have an interest in checking out the coaching program and setting up an interview to see if you would be a good fit to be one of their next students, click the contact us tab or give Jacci a call. 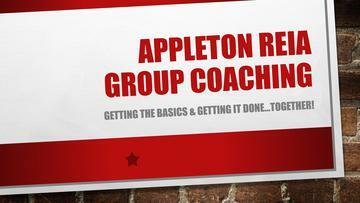 They also offer group coaching through their local association, Appleton Real Estate Investors Association, the Appleton REIA. We have a comprehensive program that will teach you how to find properties, use the contracts, estimate repairs, pull comps, market, and sell properties. You will also learn how to find financing, work with sellers who are underwater, deal with contractors and a lot more. You will receive a professional system for getting comps, regular meetings, conference calls, onsite training, a contractor database, contracts and forms, and so so much more. We are hands on and local, so you never have to worry about shelling out $20,000 - $100,000 to the TV gurus who stop into town for a weekend to sweep our local residents' pockets only to leave town and go back to their own state and leave you to figure it out on your own. If you have an interest and a desire to put proven systems to work, contact us to find out what we have to offer and how our program works. From there, we will set up a meeting with you (and spouse, if married) to discuss and see if we are a good fit to work together.